The Connect Meter is a hand held blood glucose meter that utilizes test strips to perform blood glucose measurements. 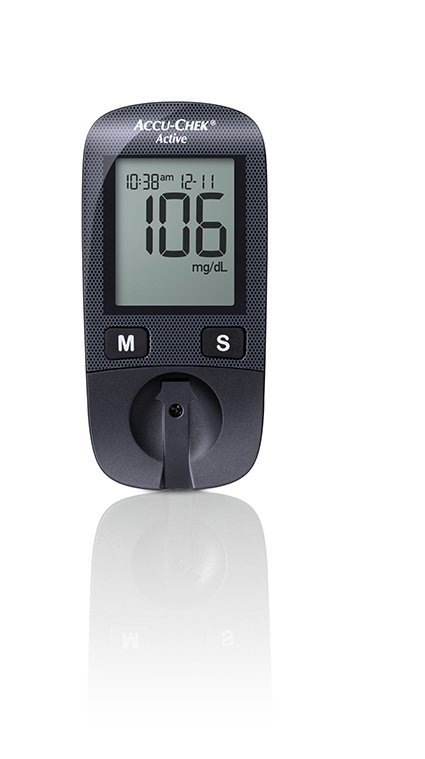 The meter stores the blood glucose measurement results as well as control results. The meter can communicate with 3rd party continua managers and an Application Hosting Device (AHD) application via Bluetooth SMART. The meter also communicates with a computer via a 1 meter USB cable provided by Roche. The Connect meter has eleven model numbers. Seven are Aviva and use Aviva test strips and four are Performa and use Performa test strips. All models use the same firmware, PWB main board and the same PWB for the button board. The PWA on the Aviva models (483, 484, 497, 498, 499, 500, 502) PWA is slightly different from the Performa models (479, 501, 503, 765) PWA. • Housing strip port area: Aviva has a 9.35 max opening and Performa has a 7.35 mm opening. • Outer labeling is different (specifies Aviva Connect or Performa Connect) • Aviva has 1 diode that Performa does not have • Aviva strip connector has 9 pins and the Performa strip connector has 7 pins • Jumper resistors are the same but populated in different locations. The different model numbers are configured for different countries for languages and units of measure (mg/dl or mmol/l) and time format.